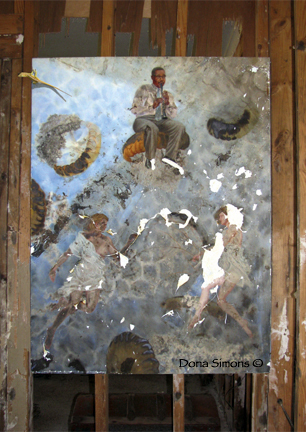 Oil paintings by Dona Simons that were flooded after Hurricane Katrina were installed hanging on the studs in her cleaned and gutted former home and studio where they previously sat in seven feet of water for three weeks in September 2005. The Art as Artifact catalog presents the oil paintings both before and after the devastating effects of Hurricane Katrina. Simons passion for Louisiana music finds expression in her work. In 2004 she completed a series of paintings titled Louisiana Music Below Sea Level presenting contemporary musicians performing in undersea settings. The underwater environment was her visual metaphor for New Orleans - before Hurricane Katrina hit. An art critic at French newspaper Nice Matin labeled her Sans doute visionaire. In a sense, her artwork foretold its own fate, as shown in the haunting images on the pages of Art as Artifact. Painting from life in the dreamlike settings of aquariums had long been an inspired form of meditation for Simons. She created paintings at aquariums in New Orleans and in the Caribbean. After spending years portraying brilliantly colored sea anemones and corals, she began including something else under the sea, a guitar player in strange harmony with the undersea-scape. Then more local musicians she admired gradually appeared. On August 30, 2005, the levee breaches after Hurricane Katrina flooded her studio, her home and many of her paintings, including those set underwater. Art as Artifact tells a visual story of Simons life and work. In addition to prescient aspects of the paintings’ subject matter, a tale is told by the stains, tears and waterlines that the canvases now contain. During the weeks the paintings spent submerged, they acquired the patina of age, surfacing like relics from an ancient civilization. The damage speaks of a catastrophic event in a specific time and place. It adds a dimension of historical significance to the artwork. In another sense the paintings became new again, as collaborative works, with Hurricane Katrina having had the last word. Art as Artifact provides a glimpse into the dramatic world of Dona Simons’ flooded paintings where beauty and destruction collide. An installation/exhibition of the flooded work was held in Simons’ flooded, gutted house. Charlie Miller played trumpet and flute one day. Michael Juan Nunez played Dobro another. Jeremy von Stilb filmed during the event for future projects. It was presented with support from the Joan Mitchell Foundation.